I've wondered that too. A friend of mine is a H/Hr shipper and Dan/Emma shipper. From her POV, the main hero deserves the girl (plus she had a crush on Dan). To me this doesn't make sense as it is well established that the main hero doesn't want the girl. They are acting like Harry and Ron were both after Hermione's love and Ron won out but the fact remains that Harry was never in the race because he wasn't interested in being in the race (plus Hermione has no romantic feelings for him at all either). The race was always going to result in Ron and Hermione getting together it was just a question of when they were going to get together, not if. Edited by GingerCat, 30 January 2011 - 09:27 PM. No doubt there are some shippers who ship H/Hr based on the movies, just as there are those who ship R/Hr based on the movies. However, there are others that ship both ships because of the BOOKS, and I think it's important we respect that. Deeplydevoted's description H/Hr shippers at the premiere actually made me smile. It reinforced my respect a little for H/Hr fans, because there are plenty out there who love the books just as much as canon shippers do. I see no harm in preferring the dynamic between a couple that's not canon and I don't think anyone should be criticised for it. I think Luna and Neville would have been cute together, for instance - am I not allowed to think that simply because they didn't get together in the books? Harry and Hermione may not have romantic feelings for eachother in canon, but that doesn't prevent a fan from thinking their dynamic would have worked well romantically. As long as a shipper is able to back up his/her opinion and it's not offensive towards other shippers, they shouldn't be attacked for giving it. Finally, I'm going to reinforce that there has been hurt on BOTH sides over the years and BOTH sides have been at fault. Please refer to my earlier post about trying to move past this. Perhaps we should get this thread on track by giving (explained)reasons for why we love our ship. I'll start. One of the things I love about Ron and Hermione is that Ron's reactions are sharpened where Hermione is concerned. For instance, he is especially observant of her. He was the first to notice her teeth had shrunk in GOF. He was the one continually observing that Hermione had disappeared in POA and calling her out on it. He also shows the strongest reactions to her being petrified in COS and her torture in DH. I'll try to provide the exact quotes later as I don't have the books on me now. Throughout the series, those heightened attentions to Hermione's presence showed how much Ron, knowingly or unknowingly, was drawn to Hermione and how she was able to affect him emotionally more than anyone else. Edited by Dumbledores Woman, 31 January 2011 - 05:11 PM. can i just say this is absolutely hilarious! i was an h/hr shipper for like two seconds but jumped shipped because i was absolutely disgusted by the way they were acting and the things they said i didn't agree with. so please stop acting like you guys are the victim here because i am just as disgusted by most h/hr shippers as you are by us! i understand this a totally rude post but when you start acting the victim and acting like you are all high and mighty above the r/hr shippers then it pisses me off! Most useless comment ever...Luckily not all the R/HR shippers are like this and this thread is the proof of it. Anyway, I'm a H/Hr shipper since always, since before the movies. I just started reading the books and I simply preferred this couple over the R/Hr one. You cannot decide that, it happens, even if you well know it's not going to work out. Ron and Hermione liked each other, it was quite clear, but I always hoped she and Harry would have ended up together. They're like brother and sister and Hermione has always had a maternal attitude towards Harry, but...despite that, I think they have a special bond, as JKR said, they share something very intense and more mature. Harry and Hermione have a good chemistry, they understand each other immediately. Ginny may be Harry's perfect partner, she cries little, loves Quidditch, but Hermione is adventurous and brilliant and saved Harry's a** tons of time! I love the way they interact in their numerous adventures, it's like they complete each other. Lastly, in my PERSONAL opinion, Ron and Hermione can work as a couple when they're teen, but I don't think they fit as adult. It's kind of odd that I created this thread and yet I've never responded in it until now. In doing so now, I can see a whole lot of postive in it. Life is how we look at it.. and we ALL look at it through different prisms. My prism is what is right for me and someone else's is what's right for them. I don't think that a H/Hr shipper is wrong, they are just different from me as a R/Hr shipper. I think (or would hope) that most people do not take offense to a different point of view... what they take offense to is the way that point of view is presented. That is why I endeavored to create this thread. So that people would have an avenue for presenting their point of view. Whether or not they chose to do so in a civilized and reasoned manner was ( and continues to be) their choice, and very revealing I might add to the kind of person they choose to be. Much more so than their preference for R/Hr or H/Hr reveals who they are. but back on topic, I wonder how much our choices have to do with how much we identify with a character? Obviously this would be vastly different from male vs. female points of view. I was never swayed by public opinion to like Ron over Hermione. I didn't read the books or watch the movies until 2010 and I am much older than most of the HP generation. I was never influenced by anyone other than my own feelings/opinions regarding the stories (which I read prior to seeing any of the movies). I love Harry as a character... to me he is much like my best friend in life (Henda) whom I consider like a brother to me. That is truly one of the reasons I will never talk down the Harry/Hermione relationship. If my best friend ever loved the same girl that I loved, and I knew that... than the girl is his, if she loves him back... that's how much I love my best friend. I happen to identify more strongly with Ron personally, and I have little doubt that it factors into my affinity for the Ron/Hermione relationship. That's not to say that I have had any kind of crush on Hermione as a character... I don't want to misrepresent that. It's just that I know Ron loved Hermione and I can see from my and his perspective the qualities in Hermione that elicited that love. 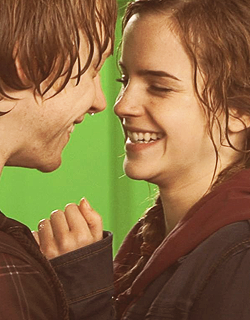 That is largely what made me want to see Ron and Hermione end up together. *hmmm on edit let me say that I did really love Hermione in the stories, or else in identifying with Ron, I would not have wanted him to be with her if I didn't* (yes... I can be quite confusing and hard to follow I know... welcome to my head... and you think it's hard for YOU?) Some people may separate themselves from characters in a story. I can do that too. There are times though where I identify with a character and I feel close to that character based upon the way I think of myself. Ron was such a character for me. 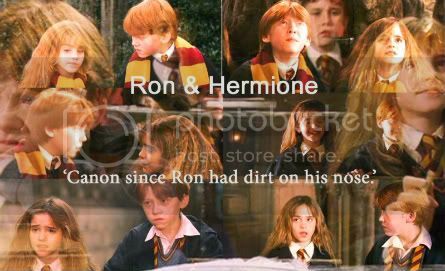 That is the basis for my wanting to see Ron and Hermione together. I wonder if from the male perspective, those whom identify themselves more closely with Harry prefered the H/Hr dynamic to the R/Hr one, or if in identifying themselves more like Harry they prefered Ginny in the books. That to me is a very interesting question that a lot of guys probably don't/wouldn't delve into. What I see on both sides of the ship though is support for one's beliefts. That is a great and noble thing. We should stand by our convictions. I'm not super magnanimous in this mind you. I definitely take offense to some of the things that are said against Ron and Hermione and even some of the things that are said in favor of Harry and Hermione. That's because.. unfortunately God/my parents/the Universe... didn't make me perfect. LOL (always looking for someone else to blame... this one *points at self*... haha) IN having my own beliefs and opinions though I TRY to see the other side. There are some parts I can see and some parts I can't. That's why JKR's comment that Harry and Hermione could have been is legit. I can see that too. There is a lot about Harry that Hermione could have fallen for and a lot about Hermione that Harry could have fallen for. I'll admit that the Draco/Hermione shippers are a BIT of a stretch for me. That said.. if they want to voice there opinions then SPEAK UP DAMN IT ALL! lol Because that's what this is about. I don't understand every perspective, but give me a reason to appreciate it and I can give you that. There are H/Hr shippers in this thread who have done that for me. It hasn't conveted me... but I'm fine with not trying to convert them when seeing their point of view. It's funny that there is a saying which goes, "Life is compromise"... I mean... REALLY? Is that the case? Because as I've experienced it, that's not always true. There are some things as people that we will always feel differently about. Even with the people we care for the most. You can take the person in the world who is MOST like me and I'm gonna bet I have differences of opinion that I feel strongly about on some things from them. I realize that... (Heck as a passionate New York Islanders Hockey fan I've even dated a New York Rangers Hockey fan in the past... now that took a leap for both her and I at the time) LOL. Life is difference. It's being separate and unique. Even my reasons for shipping R/Hr are different from Katharine's or Vida's or any of the other shippers who might agree with the same end game. So to all: Keep shipping.. and keep debating. Keep telling us the things that are the reasons for your support of your ship. When you do it, just try and consider that there might be more than one right answer. Harry and Hermione-I can't help but laugh I am sorry. First of all, Harry and Hermione make awesome best friends and siblings...she looked out for Harry like the way a mom would for her son. I am sorry but it is true. There was NO romantic tension or chemistry (books and movies) between them. Hermione never cared what Harry said to her-when he was rude towards her, cutting her off, etc. She just basically shook her head and was ok with it-it's like when siblings get mad at each other. There was no passion when they argued so to speak. But Ron? That girl cared SO freakin much when he got mad at her. Ron challenged Hermione and Hermione challenged Ron. Plus they just love each other so much-so much so that Hermione pushed aside her anger at Ron for Lavender fiasco and went to Ron-she was by his bedside, telling him she will always be there for him. Also, let's not forget the locket....before ANY H/Hr shipper tries to throw that in Romione shippers' faces think again. First, Harry really pushed Ron-he kept egging him on. He could have left Ron alone. Ron was possessed by that locket and couldn't fight it (just as Harry and Hermione couldn't fight it). But for Ron, thinking that the love of his life was in love with his best friend killed him so he did the only logical thing-he left. Hermione was DEVASTATED when Ron left. She was lost without him. I am not saying anything but that right there-screams true love. When Ron came back, Hermione still loved him-she was pissed off that he left her and Harry and needed to let him know. Btw the dance scene was added by movies-that dance scene as cute and sweet as it was (it really was adorable yes I am a DEDICATED ROMIONE shipper) but what I saw was a young woman who was so crushed by her guy's leaving, she wanted to for a moment not think of it...when she looks at Harry at the end of the dance-that look-screamed-you are not Ron-I need Ron. Also, when have we ever known Hermione to no talk? This girl didn't talk to Harry for days after Ron left and "she cried for at least a week when you left" Harry told Ron. Plus "I love her like a sister"...case closed. Again movie "THAT's MY GIRLFRIEND YOU NUMPTIES" (love this addition )...but Ron is going after 3 guys, 2 who are armed with wands...doesn't care because one of them tried to kill his girl. GO RON!! Ron and Hermione were meant to be since "you have dirt on your nose"....yes they may argue (as all couples do) but in the end they are madly in love with each other and would die for each other.